In his book, The Word of God and the Mind of Man, Ron Nash talked about propositional knowledge. What exactly is propositional knowledge? Propositional knowledge is the declarative knowledge that can be reasoned or justified. Prophecy is a great illustration of whether the revelation is propositional or not. Prophecy cannot be said to be propositional (which means, cannot be proven whether it is true or false) until it has come to pass. ..when a prophet speaks in the name of the LORD, if the thing does not happen or come to pass, that is the thing which the LORD has not spoken; the prophet has spoken it presumptuously; you shall not be afraid of him. That's why God, the Ultimate Logos, is so brilliant and beautiful, because essentially God has categorized prophecy into a propositional knowledge. It is verifiable. Otherwise, how do we know whether someone is true prophet or not? On the other hand, historical events like the resurrection of Jesus Christ and the Exodus of Moses, as pointed out by Nash on page 45, technically are non-propositional because we cannot travel back in time to verify them. Only the traces or evidences of the events can be verified to a large degree so as to allow us to give the best explanation for the conclusion. In chapter 4 of this book, Nash goes into great length to dispel the myth by the critics that the only contradiction to the E proposition (no S is P) is all S is P (the A proposition). If we buy into the all-or-none myth that ONLY the A proposition (All S is P) contradicts the E proposition (as argued by the critics) then we will be trouble because we will soon realize that some divine revelations are non-propositional (some S is not P, the O proposition), for example, the historical event of Jesus' resurrection or a believer's experience with the Holy Spirit's guidance. After all, the E proposition (no S is P) can be rewritten as “All S is not-P” which means this premise is very tightly knitted as BOTH the subject (“ALL of S”, no exception at all! ), and the predicate (“ALL are NOT P”, no exception at all!) are distributed. In other words, as long as we can show that either the subject (S) is not distributed (i.e., some S, not ALL S) OR the predicate (i.e., some are P, not ALL are NOT P) is not distributed, that would be sufficient to contradict the E proposition (no S is P , or rewritten as, All S is not P). After all, there is no degree of contradiction. It is either "contradicts" or "not contradicts". because it both cases, the P is no longer distributed (of course in the I proposition, the S is also not distributed). But, if we take the A proposition (All S is P) as a rebuttal to the critics' E proposition (All S is not P), then we are not honest to ourselves because we know that there are some S which is not propositional (Some S is NOT P, the 'O proposition'). Therefore, the preferred/honest contradiction to rebut the E proposition, (as rightly pointed out by Nash) is the I proposition, not the A proposition. In other words, the validity of the O proposition (in the case of divine revelation) invalids the A proposition. Nonetheless, as our God is a relational God, not only propositional knowledge is necessary (the assignment question of the week), non-propositional knowledge is also necessary. He relates to us, he guides us through the Holy Spirit. But these experiential knowledge, by and large, are non-propositional. 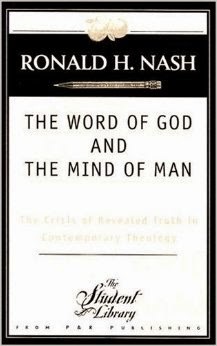 Nash, Ronald H. The Word of God and the Mind of Man. Phillipsburg, NJ: P&R Pub., 1992.